SpawGlass takes the safety of our team members, clients and business partners seriously, both on and off the jobsite. With the continued rise of phishing-based email attacks, it is important to be aware of a specific attack that may impact your organization. 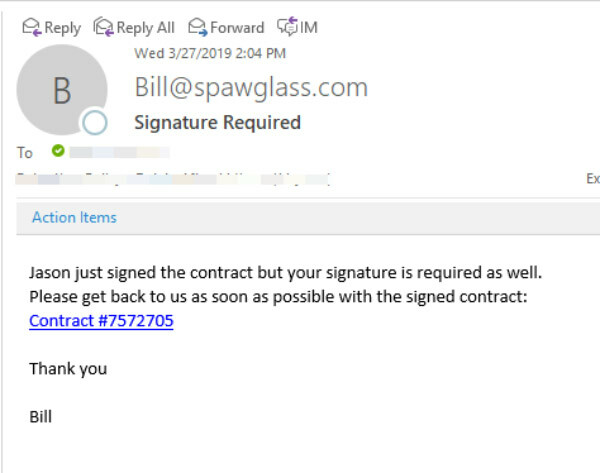 SpawGlass has witnessed recent phishing email scams from hackers attempting to infect our clients and partners by way of a spoofed email. (see screenshot). In reviewing this scam, one of the best ways to block these messages is to make sure your IT department, IT contractor or email provider has an antispam feature called SPF (Sender Policy Framework) checking enabled. This will prevent fake emails appearing to come from SpawGlass.com from reaching your organization. If your IT contact has any questions, they can contact us at SPFHelp@SpawGlass.com, and we will be glad to assist. Thank you.